Oh NO! The old CBF125 must be getting very very old and worn out as it's starting to drink fuel. I'd usually expect to reach around 280 miles before the needle started to touch the red mark on the left side of the meter. 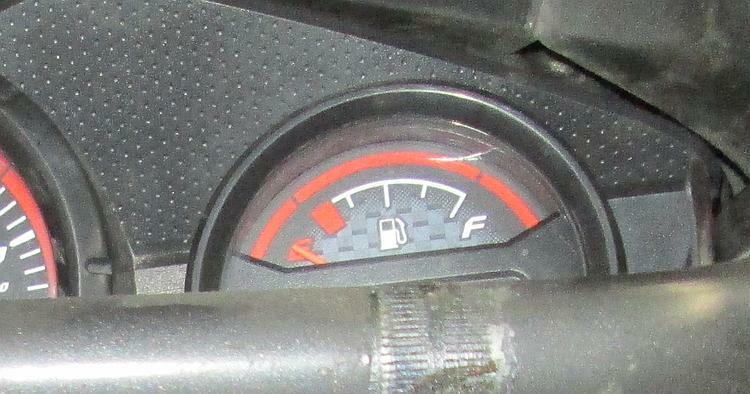 I'd still have another 30 or 40 miles before it dropped below the red mark and into the "FILL UP IDIOT!!" area. Do I need to fill up yet? Recently this has happened around the 250 mile mark. Then last night it happened at the 240 mile mark. That's it, it's had it, the engine must be about to self-disassemble as I ride it. I wonder what I should get next? Chinese scrambler? Z250SL like Sharon's? Another CBF125 engine to stick in this old hack? There is another curiosity in the ever spiralling downward condition of my long suffering hack. My tank is getting smaller too. Typically I'd put in around 10 to 11 litres, filled to the brim. Now I only seem to be putting in 8.5 to 9.5 litres. So not only is the engine on it's last legs the tank is shrinking. I...I wonder....perhaps......I think the fuel gauge is becoming a little shy? I'll give the connector from the tank to the harness a little wobble and perhaps a squirt of WD40. If that fixes it then great. Otherwise I am not stripping my tank down, stripping my wiring harness down and stripping my clocks down to fix it. I managed for years and years without a fuel gauge and I'm sure I'll manage again. I'm trying to suss out what the rusty looking bar is for,must be my eyes but it looks as though it would lock the spring up (I may need better glasses).Do you use the same filling station and pump to fill up?. That that erm well. You see Sharon is actually a hobbit. And she was learning to ride. And my 125 was too tall. So I fitted shorter shocks. So she could practice on an empty car park. There was a problem. My DIY shorter shocks had very very very very little spring effect. Still, it got her going and now she's done over 30,000 miles on her own bikes. With suspension. I was wondering about the hardtail conversion too! It's much more likely to be your fuel sender that's failing. The fuel gauge shouldn't really have any wearing parts inside, it's just a moving coil / moving iron meter. You could prove the point by going out with a small fuel can on the back and letting it actually run out. If the sender is failing then it'll tell you've run out when you've still got some left. I do believe your're right regarding the sender because some of the expected results are there and others are not. I really won't bother to fix it. I'll do what I used to do and go off mileage. I've never ever ever had to fill up below 250 miles and it's usually 300 with some spare. I'll stick to that, it'll be reet. You could be super boring (like me) and record mileage and number of litres put in at each fill up, and use something like fuelly or spritmonitor to follow MPG. That'll let you know if it's getting any thirstier.. Though I wouldn't touch it until it's managing 60MPG and 50MPH! I don't have a fuelly account but it is not uncommon for me to pull in a few hundred yards after the fuel stop to calculate my consumption. In fact keen eyed observers might notice a "Calculators And Convertors" link on the left there to simplify this. Why don't I do this at the petrol station? There is a swing of opinion that using a phone at a petrol pump is not dangerous but I am neither convinced or willing to disprove the theory. Imagine my sad little face when the calculation suggests I returned less than 140 miles per gallon. No forecourt attendant should have to see such sorrow. 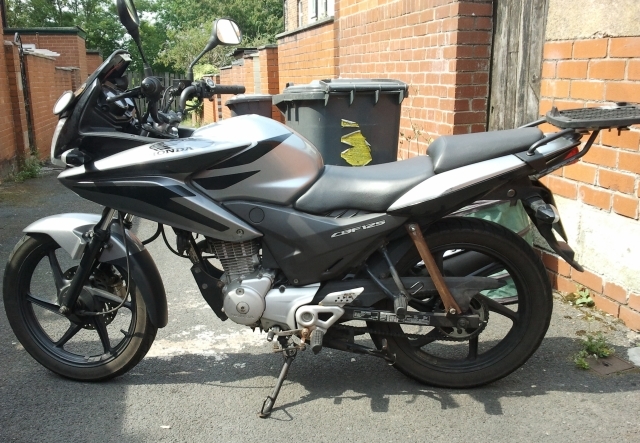 Ah the CBF125, cracking bike. Seems like your fuel gauge or sender unit is faulty. I can't see it being anything else. Yeah I reckon you're right Phil. The fuel gauge is doing some very strange things indeed now. I filled the tank right up yesterday and the gauge remained flat, no movement at all. Today it's woken up and reached half-way, then returned to zero then back up to half way once more. It used to be indecisive, it's not so sure now. Meh - As long as I fill it up every 300 miles I'll be just fine.